SVG, or Scalable Vector Graphics, is an XML based file format for describing two-dimensional vector graphics. It was created in 1999 by W3C (World Wide Web Consortium) as a standard format for displaying vector graphics on the Web. SVG can describe three types of graphics – vector graphics (paths consisting of straight lines and curves), images, and texts. These graphics can be grouped, styled, or transformed into different shapes using template objects, clipping paths, nested transformations, alpha masks, and filter effects. SVG drawings can also be dynamic, interactive, or animated. Animations may be defined either by using embedded SVG animation elements, or through scripting. Other features of SVG include hyperlink support, scripting based on events Being based on XML, and susceptibility to compression. The compression method most commonly used for SVG is gzip as it is particularly suited for it. Once an SVG file has been compressed using gzip, the file is called SVGZ and may be as small as 20% of the original file size. SVG has several variants – SVG 1.0, SVG 1.1, SVG Tiny 1.2, and SVG Basic. SVG Tiny (SVGT) and SVG Basic (SVGB) have specifically been modified for use on mobile phones and PDAs, and most mobile phones and PDAs come pre-installed with the SVG player code. Browser support for SVG is still not very even. Although other browsers do have some sort of inconsistent support, Internet Explorer does not have any support at all. Here the use of SVG requires a plugin or a converter to convert SVG to more popular formats like TIFF, PDF, BMP, PNG. The programs that open SVG files are Adobe SVG Viewer, Adobe Flash Player, Compatible Web Browser, and Inkscape on both Microsoft Windows and Mac OS; and Microsoft Visio and Corel SVG Viewer on just Windows. 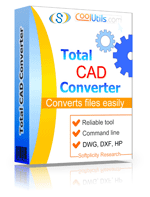 To easily convert SVG files to other CAD formats or images (DXF, WMF, PDF, JPEG, TIFF, PNG) use Total CAD Converter.